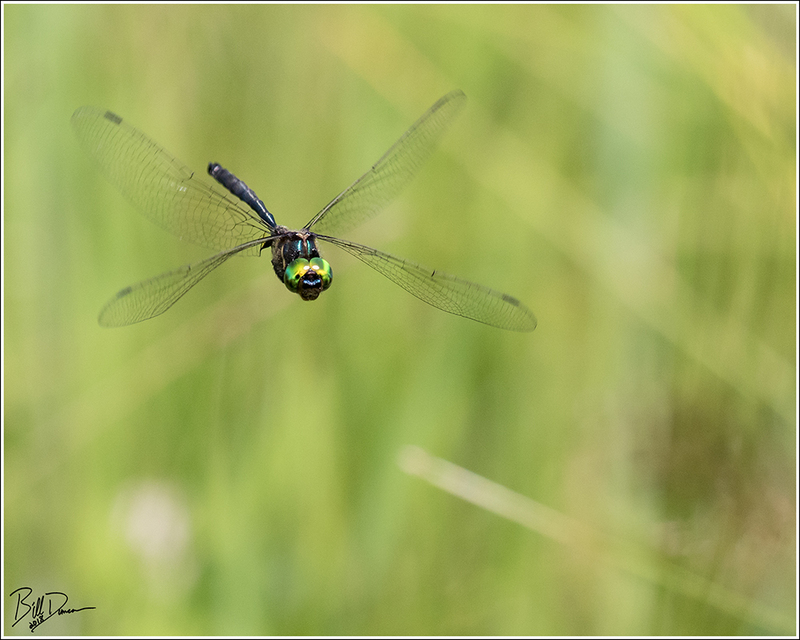 Ever since I heard that a number of newly identified populations had been discovered in Missouri, I have been wanting to find the Hine’s Emerald Dragonfly (Somatochlora hineana). I’ve gone a time or two on my own in previous years, but without specific knowledge on the where’s and when’s to find the flying adults. 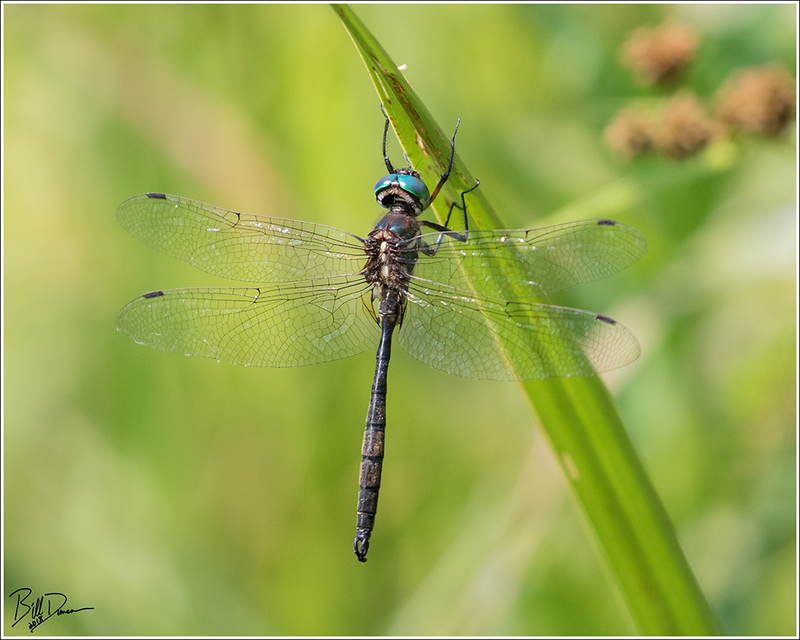 On June 16th, 2018, the Webster Groves Nature Study Society’s (WGNSS) Nature Photography Group headed to what might be the largest population of this species in the state. Thanks to WGNSS member and photographer, Casey Galvin, we were allowed access to a privately held farm in Dent County, MO that holds this population. 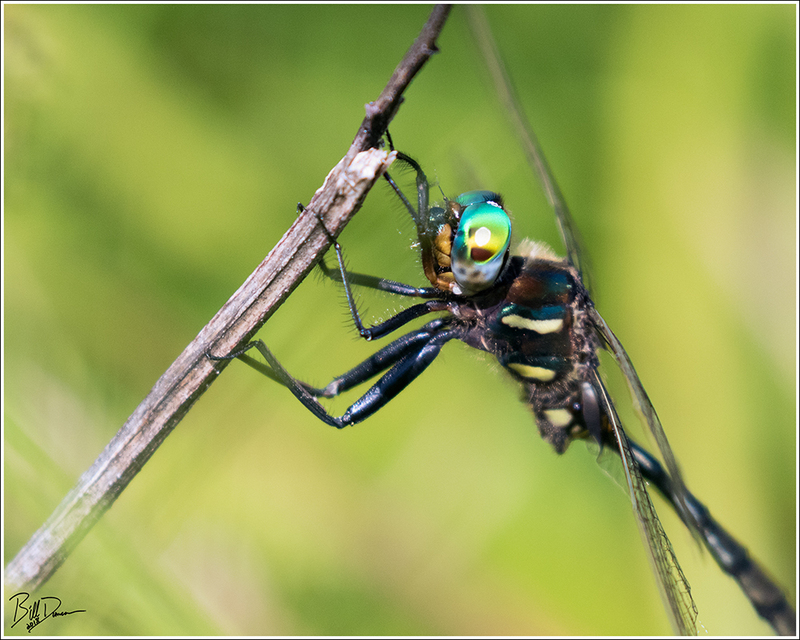 So, what is a Hine’s Emerald Dragonfly and what distinguishes them from the other 24 or so species in the Stomatochlora genus, or the “striped emeralds”? The above photo shows these distinguishing characteristics. Beyond the obvious emerald green eyes that all of the striped emeralds possess is the pair of yellow thoracic stripes on the sides of this species. Another and more diagnostic is the particulars of the genitalia. Using a good field guide will easily allow you to come to a species. Currently on the endangered species list, S. hineana was thought extinct as late as the mid 1900’s. Current populations of this species are now known from the states of Illinois, Wisconsin, Michigan and Missouri. Current population estimates indicate that there are approximately 30,000 individuals in the world. About 20,000 of these are believed to be in the species stronghold of Door County, WI. Like many of the striped emeralds, S. hineana has specific habitat requirements. The preferred habitat for this species is fens and sedge meadows overlying dolomite bedrock. 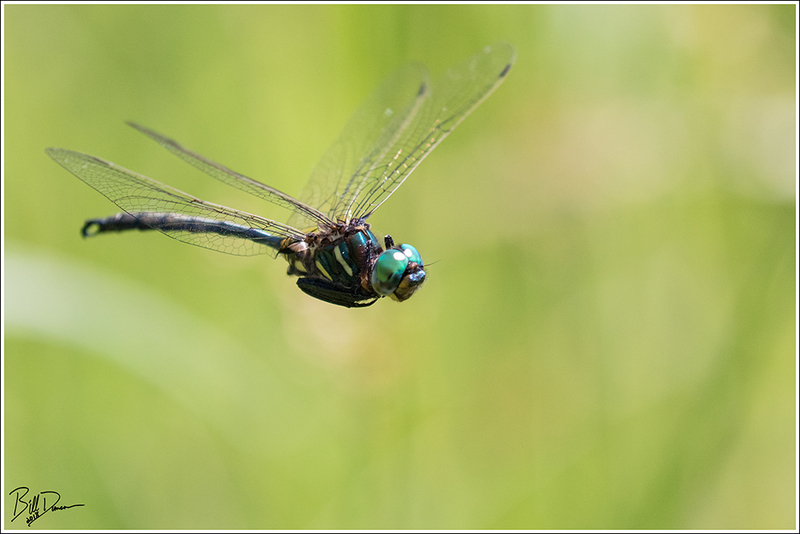 Habitat loss, pesticide use and changes in ground water are identified risk factors affecting the Hine’s Emerald. 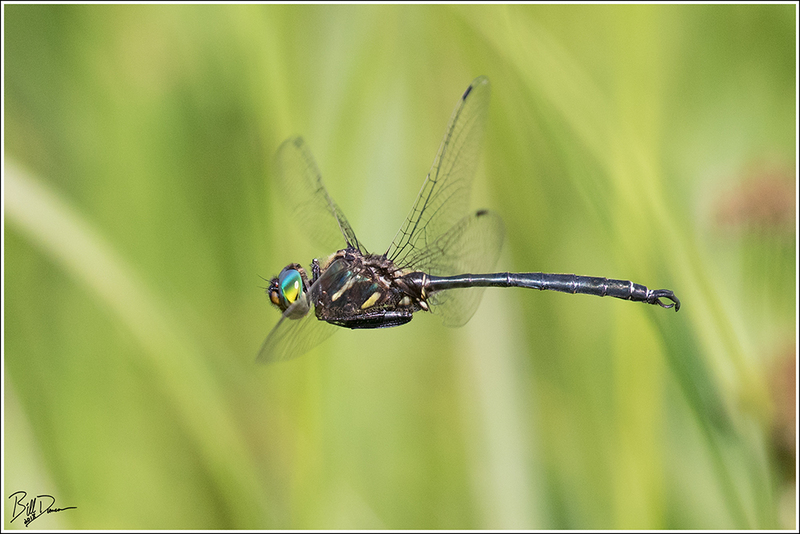 Like many dragonflies, S. hineana is a sun-lover, active in the early parts of a June morning before things get too hot and he finds a hidden perch. Until then the males are airborne, patrolling their territory in the hopes of finding a female or a male to chase away. The photographer need be patient and wait for the opportunity when the insect stops to hover in the same general place. This is the split-second opportunity that you wait for. The problem is that autofocus is of little to no help. I primarily used manual focus on the in-flight shots. There were plenty of opportunities for the patient photographer and observer. Often, an individual would fly so close to the lens we were sure it would use it as a perch. 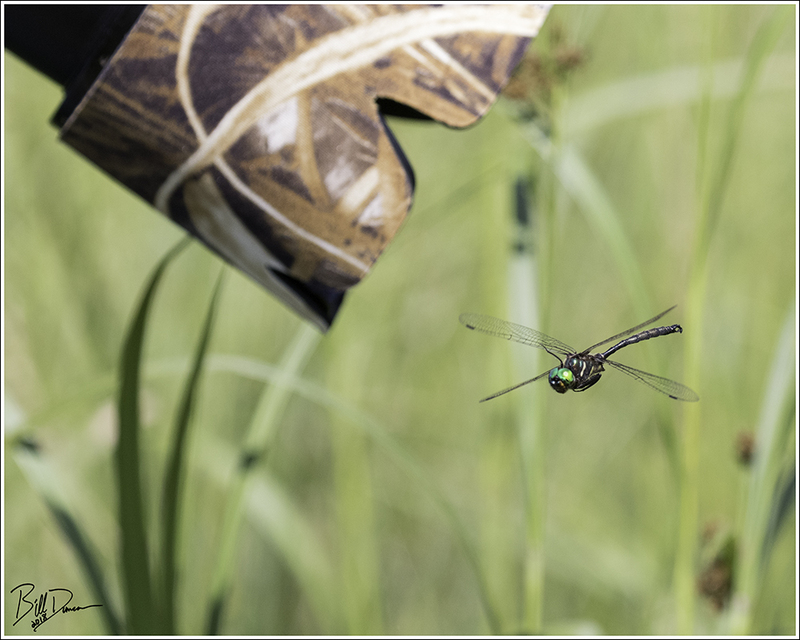 At these distances any movement by the dragonfly would throw it completely out of focus, so the photographer is looking for the sweet spot – close enough to be large in the frame, but far enough to enable tracking. It was such a thrill to finally be able to meet these guys. With this location and up to 20 others, it is nice to know that Missouri is home to such a rare gem. Hopefully it will remain so.